This is a cross post from WattsUpWithThat. 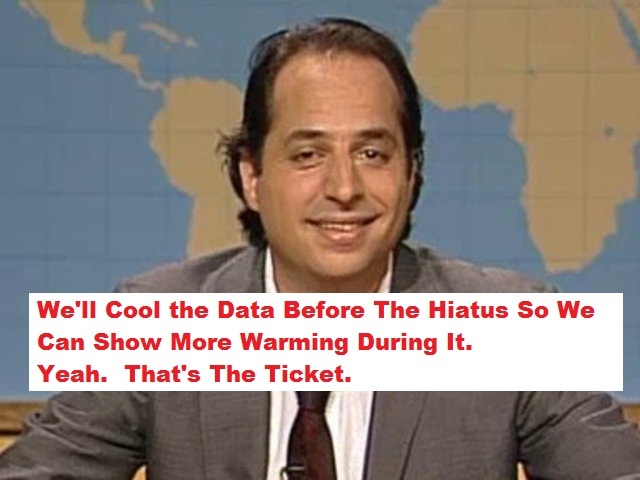 Did SNL’s Tommy Flanagan Oversee the New Surface Temperature Data? There is a new paper published the journal Science about the recent slowdown in global surface warming (released from embargo today at 2PM eastern). It is from Tom Karl and others at NOAA’s newly formed NCEI, National Centers for Environmental Information (a merger of three NOAA data centers: NCDC, NODC and NGDC) and from the government-consulting firm LMI. The lead author is Tom Karl, Director of NCEI and Chair of the Subcommittee on Global Change Research (SGCR) of the U.S. Global Change Research Program (USGCRP). 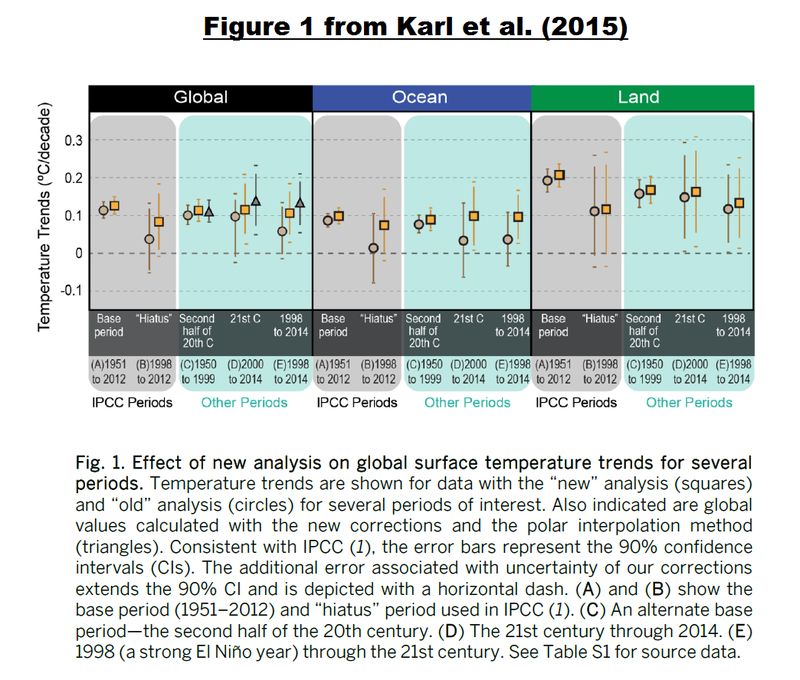 The paper is Karl et al (2015) Possible artifacts of data biases in the recent global surface warming hiatus. “Possible” is obviously the key word in the title. Please cite the journal Science and the publisher, AAAS, the science society, as the source of this information. Please hyperlink to www.sciencemag.org when publishing online. An analysis using updated global surface temperature data disputes the existence of a 21st century global warming slowdown described in studies including the latest Intergovernmental Panel on Climate Change (IPCC) assessment. The new analysis suggests no discernable decrease in the rate of warming between the second half of the 20th century, a period marked by manmade warming, and the first fifteen years of the 21st century, a period dubbed a global warming “hiatus.” Numerous studies have been done to explain the possible causes of the apparent hiatus. Here, Karl and colleagues focused on aspects of the hiatus influenced by biases from temperature observation networks, which are always changing. Using updated and corrected temperature observations taken at thousands of weather observing stations over land and as many commercial ships and buoys at sea, the researchers show that temperatures in the 21st century did not plateau, as thought. Instead, the rate of warming during the first fifteen years of the 21st century is at least as great as that in the last half of the 20th century, suggesting warming is continuing apace. According to these and other results, the authors suggest the warming slowdown was an illusion, an artifact of earlier analyses. Article #16: “Possible artifacts of data biases in the recent global surface warming hiatus,” by T.R. Karl; A. Arguez; B. Huang; J.H. Lawrimore; M.J. Menne; T.C. Peterson; R.S. Vose; H.-M. Zhang at National Oceanographic and Atmospheric Administration (NOAA) in Asheville, NC; J.R. McMahon at LMI in McLean, VA. It is also noteworthy that the new global trends are statistically significant and positive at the 0.10 significance level for 1998–2012 (Fig. 1 and table S1) using the approach described in (25) for determining trend uncertainty. In contrast, IPCC (1), which also utilized the approach in (25), re-ported no statistically significant trends for 1998-2012 in any of the three primary global surface temperature datasets. Moreover, for 1998–2014, our new global trend is 0.106± 0.058°C dec−1, and for 2000–2014 it is 0.116± 0.067°C dec−1 (see table S1 for details). This is similar to the warming of the last half of the 20th century (Fig. 1). A more comprehensive approach for determining the 0.10 significance level (see supplement) that also accounts for the impact of annual errors of estimate on the trend, also shows that the 1998–2014 and 2000–2014 trends (but not 1998–2012) were positive at the 0.10 significance level. As shown in their Figure 1 (also our Figure 1), Karl et al. (2015) used the periods of 1951 to 2012 and 1950 to 1999 as references for the recent slowdown in surface warming. The IPCC’s 5th Assessment Report serves as the justification for the early-1950s start point for their reference periods. See Chapter 2 and Chapter 9 of AR5 for the IPCC’s brief mention of the slowdown in global surface warming. Yet the climate model-based projections of a disaster-filled future global surface warming better align with the warming rate of the recent warming period, which began in the mid-1970s, not 1950. See Figure 2, which uses the GISS Land-Ocean Temperature Index data, because the new NCDC data have not yet been released. Keep in mind there was an earlier hiatus that lasted from the early-to-mid 1940s to the mid-1970s. If NOAA would like to revise their estimates of future global warming to reflect the more benign warming rate of 0.1 deg C/decade from 1950 to 1999, it would be a big step toward their coming to terms with reality. We illustrate the ever-growing differences between models and data in the monthly global surface temperature (and lower troposphere temperature) update posts. Figure 3 is the model-data comparison from the April 2015 update. Third, there have also been advancements in the calculation of land surface air temperatures (LSTs). The most important is the release of the International Surface Temperature Initiative (ISTI) databank (14, 19), which forms the basis of the LST component of our new analysis. The ISTI databank integrates the Global Historical Climatology Network (GHCN)–Daily dataset (20) with over 40 other historical data sources, more than doubling the number of stations available. NCDC has been in the business of adjusting the surface temperature record for quite some time. The modus operandi so far has been to get a new paper published describing what NCDC considers to be a new and improved dataset, and since NCDC’s articles are often peer reviewed by other government employed scientists at NOAA, they often don’t get a critical peer review. Certainly, based on the reports I’ve received over the years, few if any skeptic scientists have ever been asked to review an NCDC paper on a new global temperature dataset and the techniques involved. Fortunately, it is very easy to divine such adjustments by comparing the raw data and the final adjusted data, as shown in the graph below. Note how the past gets cooler, centered around 1915 and the present gets warmer. On May 2, 2011, NCDC transitioned to GHCN-M version 3 as the official land component of its global temperature monitoring efforts. In November 2011, the GHCN-M version 3.1.0 replaced the GHCN-M version 3. 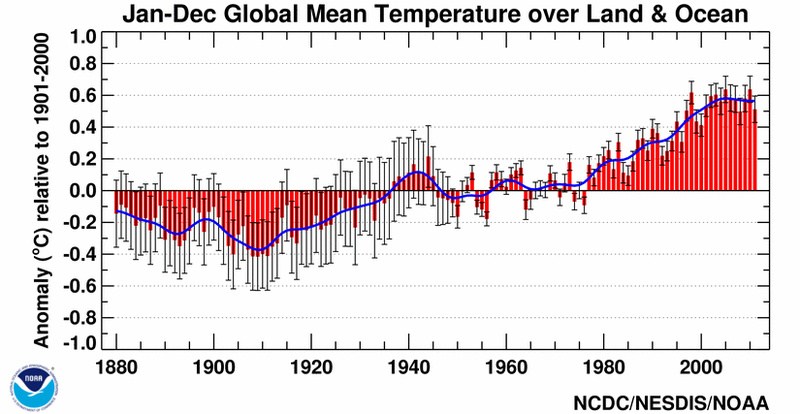 The overall net effect of the transition from GHCN-M version 2 to version 3 is to increase global temperatures before 1900, to decrease them between 1900 and 1950, and to increase temperatures after 1950. The diagram below exemplify adjustments made by NCDC since May 2008 for two single months (see arrows in diagram above); January 1915 and January 2000. Hold that thought, because NCDC is at it again. You’ll note in Figure 1 that the biggest changes between the new and old NOAA data during the global-warming-slowdown periods are in the sea surface temperature data, not the land surface air temperature data. Those adjustments are supposed to be justified by ship-buoy biases. See the quotes in the post Quick Look at the DATA for the New NOAA Sea Surface Temperature Dataset, under the heading of SHIP-BUOY BIAS CORRECTIONS IN ERSST.v4. THE UKMO HASST3 data have also been adjusted for ship-buoy biases. 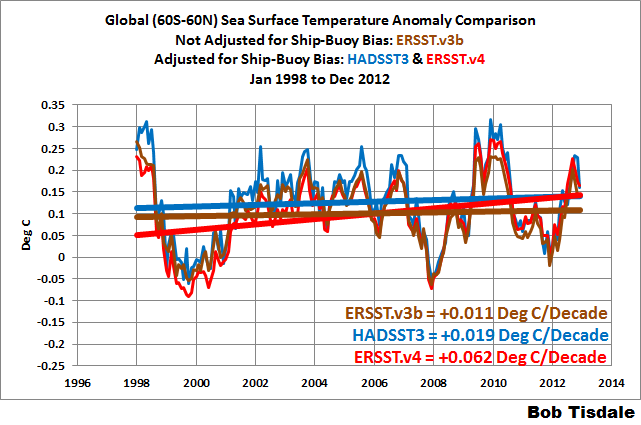 For the two slowdown periods presented by Karl et al., Figures 6 and 7 compare the HADSST3 and the new NOAA ERSST.v4 data, both of which have been “corrected” for ship-buoys biases, to the older NOAA ERSST.v3b which had not been adjusted for those biases. 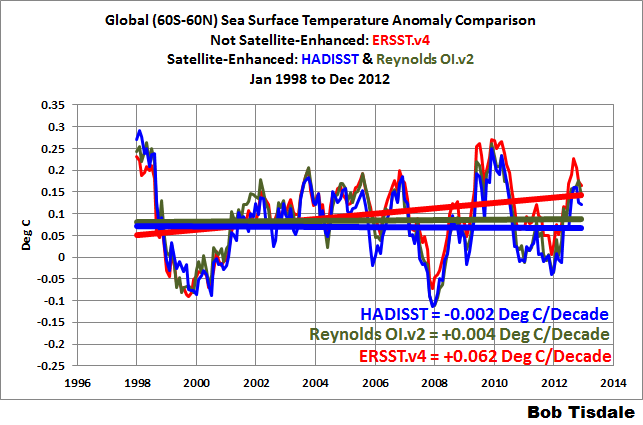 During both periods, the bias-adjusted HADSST3 data have a much lower trend than the bias-adjusted NOAA ERSST.v4 data. 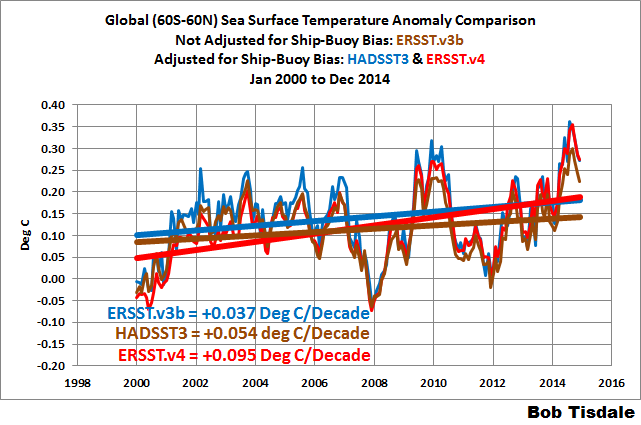 In fact, the bias-corrected HADSST3 data in both cases is more in line with the older NOAA data than the new. And just in case you’re wondering, the new NOAA ERSST.v4 data are compared to the NOAA and UKMO satellite-enhanced sea surface temperature data in Figures 8 and 9. As noted in the heading, with their new adjustments, NOAA has created an outlier in their new sea surface temperature dataset. Add that to the curious spike in the late-1930s and1940s that can’t be explained by climate models, which were presented in the post here. 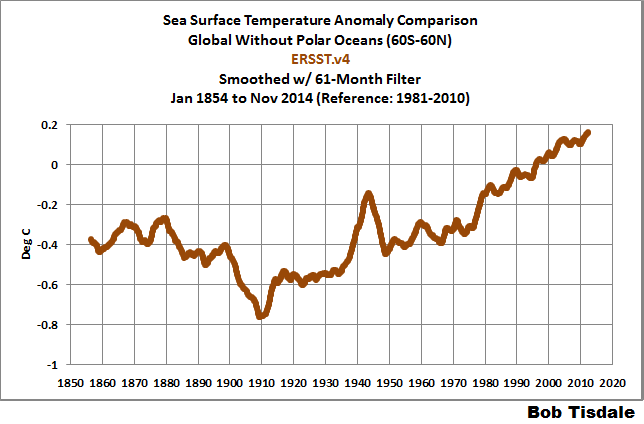 The satellite era of sea surface temperature data started in November 1981. 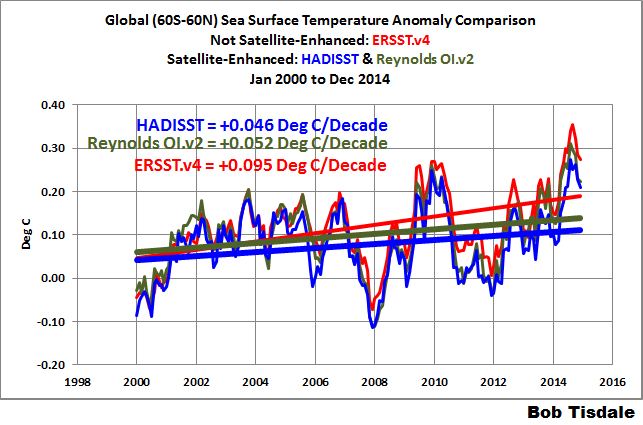 Neither of the NOAA sea surface temperature reconstructions (new or old) utilize the satellite-enhanced data. The original version of the NOAA ERSST.v3 data included satellite data when they were first released in 2008, but the satellite data were removed before the dataset became “official” because they did not meet political agenda of the dataset users, which were only NOAA at that time. The revised dataset was renamed ERSST.v3b. It is ERSST.v3b that Karl et al. are calling the “old” data. But we can learn something very interesting if we compare NOAA’s ERSST.v4 (new) and ERSST.v3b (old) data during the satellite era. See Figure 10. The warming rates are the same. 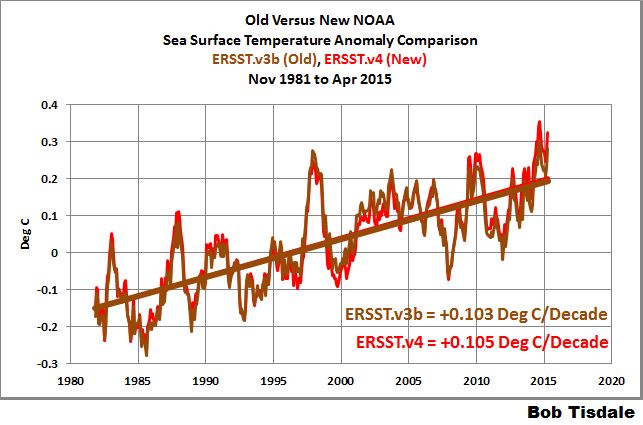 If we subtract the ERSST.v3b (old) data from the new ERSST.v4 data, Figure 11, we can see that that is exactly what NOAA did. Remember the adjusted data from figures 4 and 5 above? Figure 11 uses the same data subtraction method to determine the difference between the original measured data, and the “new and improved”adjusted data courtesy of government-funded science. It’s the same story all over again; the adjustments go towards cooling the past and thus increasing the slope of temperature rise. Their intent and methods are so obvious they’re laughable. It’s like John Lovitz Saturday Night Live character “Pathological liar”, Tommy Flanagan was in charge. Gee, we need to show more sea surface warming during the hiatus, but we don’t want to increase the trend since about 1982. It’s hard to imagine how anyone could take the new NOAA global surface temperature data seriously. The sea surface temperature data presented in this post are available from the KNMI Climate Explorer. The greatest changes in the new NOAA surface temperature analysis is to the ocean temperatures since 1998. This seems rather ironic, since this is the period where there is the greatest coverage of data with the highest quality of measurements – ARGO buoys and satellites don’t show a warming trend. Nevertheless, the NOAA team finds a substantial increase in the ocean surface temperature anomaly trend since 1998. In my opinion, the gold standard dataset for global ocean surface temperatures is the UK dataset, HadSST3. A review of the uncertainties is given in this paper by John Kennedy http://www.metoffice.gov.uk/hadobs/hadsst3/uncertainty.html. Note, the UK group has dealt with the same issues raised by the NOAA team. I personally see no reason to the use the NOAA ERSST dataset, I do not see any evidence that the NOAA group has done anywhere near as careful a job as the UK group in processing the ocean temperatures. With regards to uncertainty, in their ‘warmest year’ announcement last January, NOAA cited an error margin in the global average surface temperature anomaly of 0.09oC. 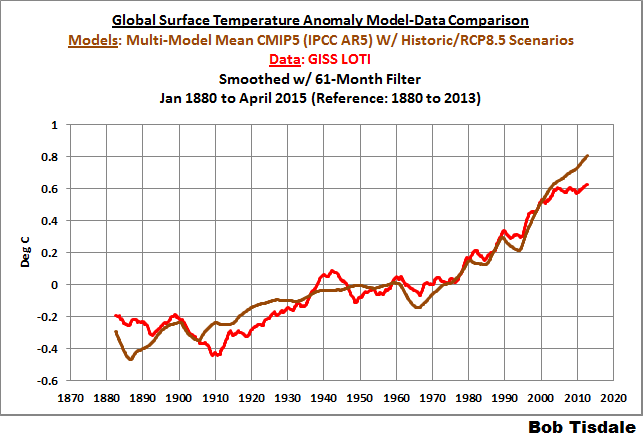 The adjustments to the global average surface temperature anomaly is within the error margin, but the large magnitude of the adjustments further support a larger error margin. But they now cite a substantially greater trend for the period 1998-2014, that is now statistically greater than zero at the 90% confidence level. My bottom line assessment is this. I think that uncertainties in global surface temperature anomalies is substantially understated. The surface temperature data sets that I have confidence in are the UK group and also Berkeley Earth. This short paper in Science is not adequate to explain and explore the very large changes that have been made to the NOAA data set. 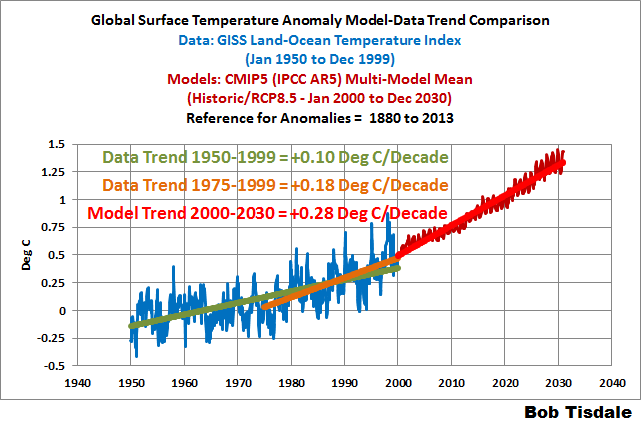 The global surface temperature datasets are clearly a moving target. So while I’m sure this latest analysis from NOAA will be regarded as politically useful for the Obama administration, I don’t regard it as a particularly useful contribution to our scientific understanding of what is going on. This entry was posted in CAGW Proponent Arguments, Hiatus, NCDC, NOAA ERSST.v4. Bookmark the permalink. Thanks, Bob. Very good data analysis. “Possible artifacts of data biases in the recent global surface warming hiatus”. Possible, not actually found, nor shown. I guess this is not very “robust”. Isn’t this an admission that ARGO doesn’t work, has never worked and they wasted more than $1 billion on it? The reason for the adjustment is to justify spending more money on a system they just ‘scientifically proved’ doesn’t work! Alec aka Daffy Duck, ARGO isn’t used for sea surface temperature. Off topic; is sea surface height a fair indicator of temp/temp to some depth? I’ve often see it mention regarding El Niño and the ‘stored up heat’ in the pacific. Alec, there are many factors that influence sea surface height. Ocean temperatures from surface to the ocean floors are one of the major contributors. In fact, sea surface height anomalies are often used as a proxy for subsurface temperature anomalies for the entire column of water. 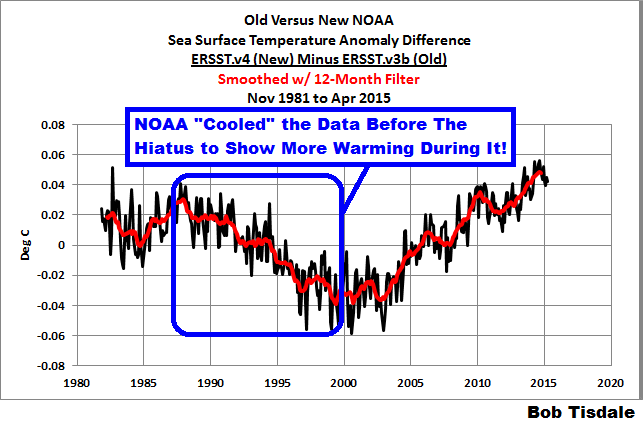 Pingback: More Curiosities about NOAA’s New “Pause Busting” Sea Surface Temperature Dataset | Watts Up With That? Hi Bob, thank You for the great work! By all this fideling around with all the data and corrections, adaptions and homologations – is anybody capable to get a trustworthy result in this issue?